Introduction and Definitions. 2. Fundamentals of the Chromatographic Process. Flow of Gases through Chromatographic Columns. 3. Fundamentals of the Chromatographic Process. The Thermodynamics of Retention in Gas Chromatography. 4. Fundamentals of the Chromatographic Process. Chromatographic Band Broadening. 5. Fundamentals of the Chromatographic Process. Column Overloading. 6. Methodology. Optimization of the experimental conditions of a chromatographic separation using packed columns. 7. Methodology. Advanced Packed Columns. 8. Methodology. Open Tubular Columns. 9. Methodology. Gas Chromatographic Instrumentation. 10. Detectors for Gas Chromatography. 11. Qualitative Analysis by Gas Chromatography. 12. Qualitative analysis. Hyphenated Techniques. 13. Quantitative Analysis by Gas Chromatography. Basic Problems, Fundamental Relationships, Measurement of the Sample Size. 14. Quantitative Analysis by Gas Chromatography. 15. 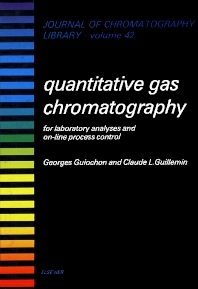 Quantitative analysis by Gas Chromatography. Measurement of Peak Area and Derivation of Sample Composition. 16. Quantitative Analysis by Gas Chromatography. Source of Errors, Accuracy and Precision of Chromatographic Measurements. 17. Applications to Process Control Analysis. Appendix: Chromatography Lexicon. Subject Index. Here is an invaluable new book on quantitative gas chromatography which explains how the method can - or should - be used for accurate and precise analysis. Gas chromatography is firmly established as one of the few major methods for the quantitative analysis of complex mixtures. It is fast, accurate and inexpensive, with a broad range of applications. It has however become very complex and involved: over 200 stationary phases, more than 10 detector principles and several very different column types are available from among the catalogs of over 100 manufacturers and major retailers. The progressive changes in the nature of gas chromatography have created new needs for information which are not satisfied by the literature presently available. This book provides a complete discussion of all the problems involved in the achievement of quantitative analysis by gas chromatography, whether in the research laboratory, in the routine analysis laboratory or in process control. For this reason the presentation of theoretical concepts has been limited to the essential, while extensive explanations have been devoted to the various steps involved in the derivation of precise and accurate data. This starts with the selection of the instrumentation and column, continues with the choice of optimum experimental conditions, then calibration and ends with the use of correct procedures for data acquisition and calculations. Finally, there is almost always a way to reduce errors and an entire chapter deals with this single issue. Numerous relevant examples are presented. The first part of the book presents the theoretical background, simple enough to be understood by all analytical chemists, but still complete and up-to-date. It discusses the problems of flow dynamics, retention and band broadening. The changes in band profile associated with column overloading are explained without much recourse to mathematics. The second part describes the gas chromatograph and discusses the properties of each of its parts: gas flow and pressure controller sampling system, oven, column switching valves, detectors. The different implementations, their advantages and drawbacks are discussed and compared. In addition, three chapters present packed column technology, open tubular column technology and some sophisticated new phase systems, respectively. The new phase systems described use adsorbents, modified by coating or grafting organic phase, and carrier gases containing vapors which are sorbed by the stationary phase and modify it, such as steam. The third part discusses the applications in qualitative and quantitative analysis. Calibration, peak integration, sources of errors arising from the various parts of the instrument as well as from the measurement process itself are carefully described in four detailed chapters. Methods to carry out accurate and precise analysis are presented. A last chapter is devoted to process control analysis and gives a number of detailed examples of applications. A lexicon explaining the most important chromatographic terms and a detailed index complete the book. This is a book which no chemical analyst should be without. It should be on the library shelf of all universities, instrument companies and any laboratory and plant where gas chromatography is used.